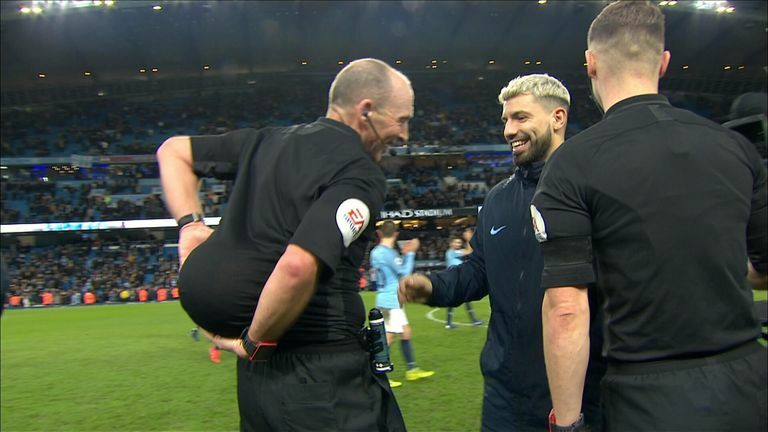 Mike Dean decided to have some fun after Manchester City's 6-0 thrashing of Chelsea by hiding the ball from hat-trick scorer Sergio Aguero. After blowing the full-time whistle, the referee put the ball up the back of his shirt. However, he then rolled it out with a smile and handed it to Aguero, who was celebrating his record-equalling 11th Premier League hat-trick. Another hat-trick for Aguero would see him claim the all-time Premier League record from Alan Shearer. Watch Mike Dean hide the ball from Aguero in the video at the top of the page.